Symptoms of schizophrenia usually appear in adolescence or young adulthood, but new research reveals that the brain disease likely begins very early in development, toward the end of the first trimester of pregnancy. The finding opens up a new understanding of this devastating disease and the potential for new treatment possibilities in utero. The findings provide powerful evidence that schizophrenia begins early in fetal development, said Michal K. Stachowiak, PhD, lead author and professor in the Department of Pathology and Anatomical Sciences at UB. "This disease has been mischaracterized for 4,000 years," he said, referring to the first time a disease believed to be schizophrenia was described in the 1550 BC Egyptian medical text, the Ebers Papyrus. "After centuries of horrendous treatment, including even the jailing of patients, and after it has been characterized as everything from a disease of the spirit or moral values or caused by bad parental influence (a concept that appeared in psychiatric textbooks as recently as 1975) we finally now have evidence that schizophrenia is a disorder that results from a fundamental alteration in the formation and structure of the brain," Stachowiak said. To find out, Stachowiak and colleague and spouse, Ewa Stachowiak, PhD, assistant professor of pathology and anatomical sciences, adapted mini-brain technology, growing in vitro miniature brain structures called cerebral organoids. "The goal was to, in a sense, recapitulate important stages in brain formation that take place in the womb," said Stachowiak. "We mimic this process in the laboratory with stem cells, focused specifically on developing the cerebral organoids that resemble the developing human brain in its earliest stages of growth," he said. The UB approach modifies a recently developed protocol for developing early brain structures in vitro. "At this stage, we discovered critical malformations in the cortex of the mini-brains formed from the iPSCs of the patients with schizophrenia," said Stachowiak. That made sense, he added, since increasing evidence has recently linked schizophrenia to abnormal functioning in the cortex, the largest part of the brain, which is responsible for such critical functions as memory, attention, cognition, language and consciousness. "Our research shows that the disease likely starts during the first trimester and involves accelerated cell divisions, excessive migration and premature differentiation of the neuroectodermal cells into neurons," he continued. "Neurons that connect different regions of the cortex, the so-called interneurons, become misdirected in the schizophrenia cortex, causing cortical regions to be misconnected, like an improperly wired computer. 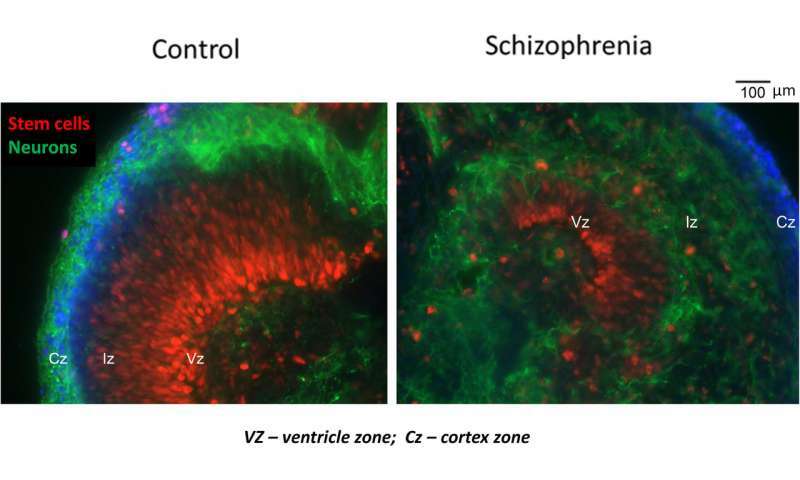 "We now can state that schizophrenia is a disorder of faulty brain construction that occurs early in development, corresponding to the first trimester, and involving specific malformation of neuronal circuits in the cortex," he said. The experiments implicate the dysregulation of the INFS mechanism as a trigger for deconstructing gene networks in the developing brain cells of individuals who will later develop the disease. "The next step is to investigate how to target the INFS pathway and even other pathways that interact with INFS using drugs or even dietary supplements that could prevent the dysregulation from taking place," he continued, noting that this kind of supplementation has been effective with disorders such as spina bifida, for example. Stachowiak noted that the brain organoid model he and his colleagues have developed is already proving applicable to other diseases. The National Science Foundation has funded Stachowiak and Josef M. Jornet, PhD, assistant professor in the Department of Electrical Engineering in the UB School of Engineering and Applied Sciences, to use these models to explore what he calls brain-machine interfaces, treatments that would be useful in eventually guiding the regeneration of brain tissue after trauma or a stroke. "We are working on combining the organoid research with smart nanophotonic devices to develop a new generation of brain-machine interfaces," explained Stachowiak. "With this technology, one may eventually be able to control and correct development of cells in complex tissue of the developing brain. An important step toward developing such technologies will be testing them in cerebral organoids or mini-brains to see if they can actually direct and modify the developing brain in real time." Your writer believes that the meat controls the mind.